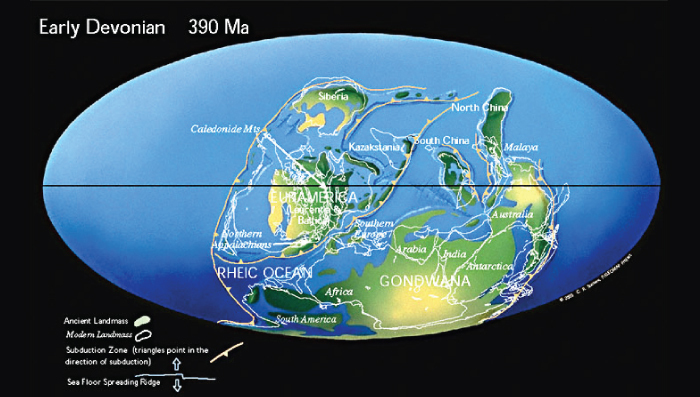 The continents that had separated during the breakup of Rodinia during the Proterozoic and Early Paleozoic drifted together again eventually forming another supercontinent Pangea by the end of the Paleozoic. During the Devonian Period the oceans were closing as the continental plates moved closer together and collided forming mountain ranges such as the Appalachians in North America. The North China and South China blocks were still separate and low-lying. They were largely covered by shallow seas in which thick deposits of limestone accumulated. During the Carboniferous the large southern continent Gondwana moved over the South Pole, triggering a widespread glaciation. 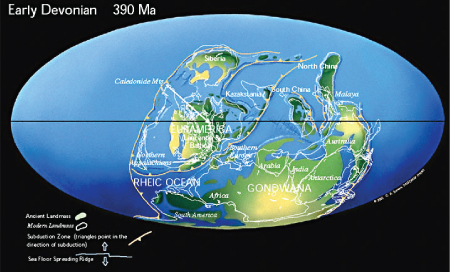 By the end of Permian the North China and South China blocks advanced northwards eventually colliding with Siberia in the Triassic, and ultimately joining all of the other landmasses to form the supercontinent Pangea. To the east of Pangea lay the largely enclosed oceanic basin, Tethys. The rest of Earth was covered by a single ocean, known as Panthalassa.